3 Beds 2 Baths 1,150 Sq. ft. 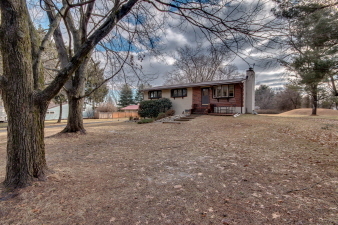 Traditional Raised Rancher sitting on 1 acre wooded lot Features Large living room with brick Fireplace opens to Dining room with large Bay window and Cathedral beamed ceiling, Dining room opens to Eat in kitchen with solid white raised cabinetry, Jenair glass top range and light pine floors. Wall to wall carpet over hardwood floors T/O main living area. Hall bath and 3 bedroom featured on the main living area. Lower level features large Family room with fireplace, newly renovated full bath with neo angle shower, Large laundry room. 2 car garage.